This blog has been dormant for so long I don't quite know where to begin in trying to reawaken it. So I'll start with some pieces of art by Frantisek Muzika that I found on Tumblr a while back and was blown away by. 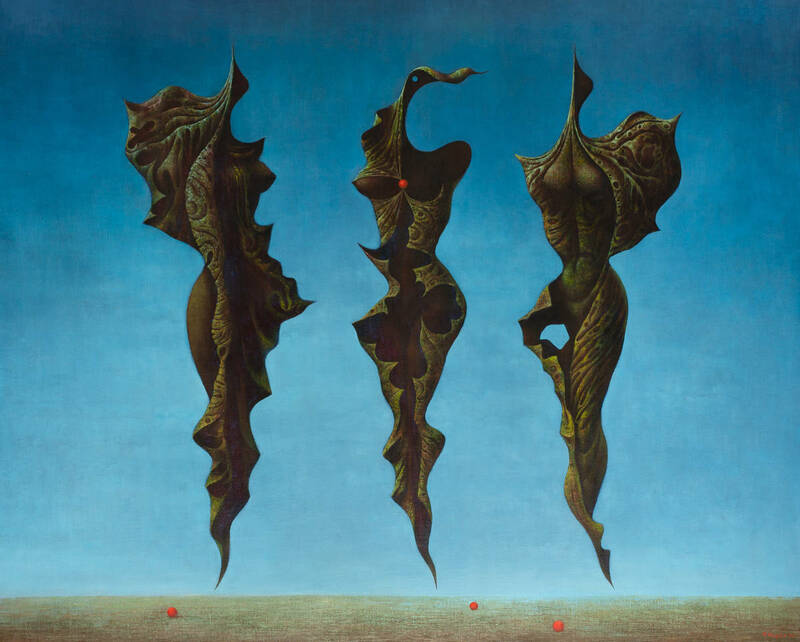 Muzika was a Czech surrealist painter active throughout the 20th century. Unfortunately, I can find relatively little about him on the internet despite the radiant splendor of his work. 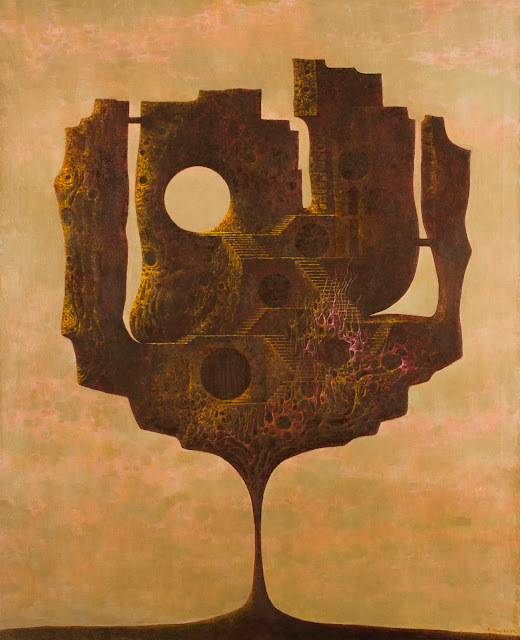 He was a contemporary of Dali's and his work bears some resemblances with its barren landscape backdrops and bizarre structures, but there appears to not even be any books about his work out there. I don't even know what these pieces are titled. But the contours and textures of these odd stone slabs mesmerizes me. I stumbled upon them via Tumblr, a platform I've found extremely satiating to my hunger for visual art. (I recently set up my own Tumblr page, nothing special, but if you're interested check it out.) How else would I have been able to discover this somewhat obscure Czech surrealist master? 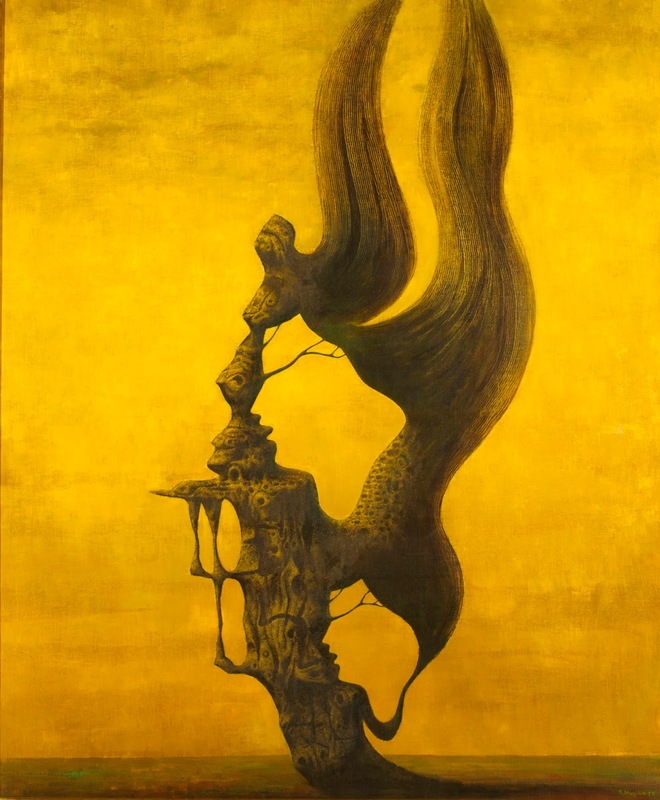 Speaking of obscure, underappreciated 20th century artists, my Finnegans Wake reading group and I recently stumbled upon a treasure trove of artwork by the relatively unknown painter Elsa de Brun (aka NUALA) and have now taken it upon ourselves to bring her work back out into the world. NUALA created a set of 43 pieces called "Valentines for James Joyce" inspired by lines from Finnegans Wake. These pieces are all in charcoal with a depth and complexity that astounded us when we saw them in person. As a result, we are now in pursuit of gathering these pieces into book form and possibly a future exhibition to remind the world of this forgotten, brilliant and fascinating woman. A big reason for my lengthy absence of late is that I've been fully devoted to writing my first book, an exploration of some fascinating links between Salvador Dali and James Joyce centering around one particular painting. If you've read this blog for any amount of time, you're probably aware of the source material and how important this project is to me. This work has been going on for a very long time but it's now finally picking up and progressing toward completion. It's been a classic creative struggle in that the bigger and more significant the project is, the harder it is to work on, but a helpful guide to creative battles called The War of Art has helped me properly direct my focus. With my writing energies being poured into to that project, my output on this and my other blog will likely continue to wane for a while but there remain tons of ideas ready to bloom both here and there so please do stay tuned. I also need lots of breaks from the artsy fartsy stuff so fantasy football, the MLB pennant race, and the latest greatest hip hop music should get writeups in the near future in this space as well. 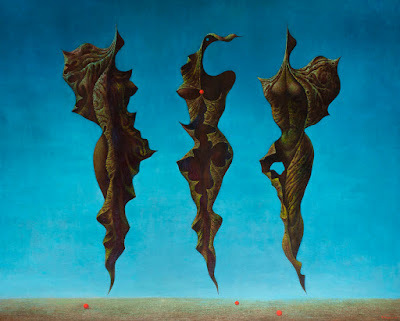 In closing, another surrealist contemporary of Dali has intrigued me of late. 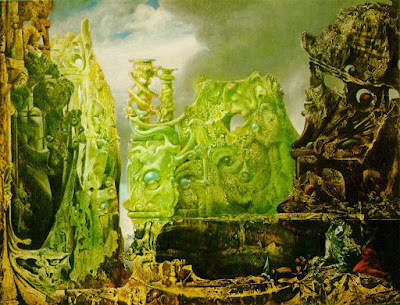 German painter Max Ernst is properly recognized but I had never dug into his work much. Thanks again to Tumblr I've found some pieces that have really struck me with their mix of intricately detailed, vibrant bizarreness and precise, enclosed form.